Last weekend was quite busy. A wedding on Saturday then a newborn party on Sunday, both accompanied with many hours of travelling. On Friday I received a text from my husband asking me if I could make a large card for his friend who was getting married, maybe 8″ by 11″? I told him later that I would need a poster size paper to make that card. Anyways, I ended up making a 5.5″ by 8.5″ card. Me: So, what kind of card do you want? Friend at the table: ok, ok let’s not get carried away. We don’t want to give them the wrong impression. Normally I go for white themed cards for weddings, but this time I decided to go with red and gold. After all, it was a South Asian wedding. Everything is gold embossed on the red panel. I used the Mehndi Medallion Mini Stamp set from Papertrey ink for the decoration. The large sentiment in the center is hand-drawn (I am thinking I should turn it into a stamp!..it took way too many steps to achieve the embossing). It says “alf Mabrook” in Arabic, meaning thousand Congrats. 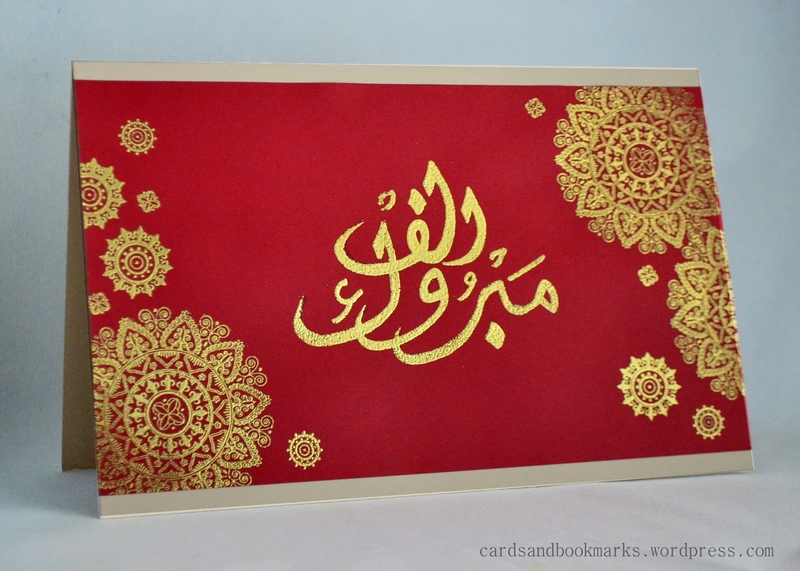 I wasn’t sure what Arabs use for wedding greeting cards…did a little Google search and this is the best I came up with. For Sunday’s card, I decided to use patterned paper and try the tag on a card style. It makes things simple and quick! I also used my new Simon Says Stamp bow die here. The strip of glitter at the bottom is double sided tape and Ritz Stardust Glitter, and the bow is made out of felt. I usually don’t write about non-card related things here, but I felt a bit chatty today, and hence the long wordy post! As usual thanks for stopping by, and for leaving your kind comments! I am completely speechless at the measure of your talent. This card is incredible and there is such a need for this in our community. Fantastic, you need to sell these!!! Hee hee – maybe it is a guy thing….conversations with my husband about cards go pretty much the same way! The wedding card is gorgeous! Hand-drawing scares me, I’m so impressed with how yours turned out! Your second card is adorable – I love the mix of textures and the pop of pink! Tasnim, the card you made for your husband’s friend is stunning. I love the gold juxtaposed against the boldness of the red. Very pretty! 🙂 I loved the chatty post, Tasnim! Love that conversation, LOL! I was imagining you ending up with a wedding/baby card (that WOULD have shocked them). Your hand drawn arabic is very beautiful, and the rich colours are fabulous. I also love your second card for completely different reasons – CAS and beautiful! Your hubby should know by now that you are the CARD GENIUS!! Way to customize the cards for special people and occasions! I love how you took the challenges and make them work so beautifully! Your post totally made me laugh out loud Tasnim, and I think your card is perfect for the occasion! Love how you wrote this post for starters! Then the calligraphy of your Arabic – stunning!! Mine is very rusty, but I used to be able to do that only after studiously copying a piece I had seen. Your work is outstanding and that card should be framed!! Hi Tasnim. Your cards are both beautiful, but the first one is very “wowable” 🙂 and you did a great job with the hand-drawn words…they look so professional. You are an artist!